I can't believe I'm at 24 weeks already. Now, the baby is viable! 6 months pregnant :O This is definitely the week where I say "I've popped". I'm still feeling really heavy at the bottom of my belly and although she's kicking me all over, the majority of kicks are still quite low down. This is the week where I've noticed that I'm going to the toilet a lot more and it's now meaning a toilet trip is needed in the middle of the night. I've also had to enlist Chris's help to get up off the sofa a couple of times and, apologies for the TMI but, I had my first experience of breast milk leakage on my PJ top! 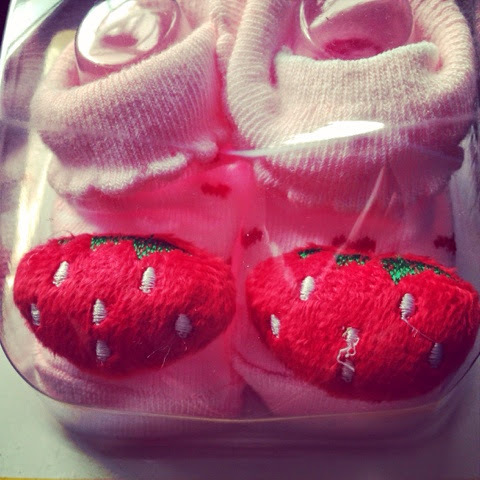 We did a little shop and bought these gorgeous pink baby grows from Matalan which were £12 for the three of them. I ordered these cute strawberry booties from Amazon a few weeks ago because they were a bargain at £1.90 with free delivery and they arrived this week. I love them! Chris's mum and nan had also gone shopping and bought us some lovely bits too; a Hello Kitty babygrow, a Bambi babygrow and a gorgeous little pink dress and leggings. 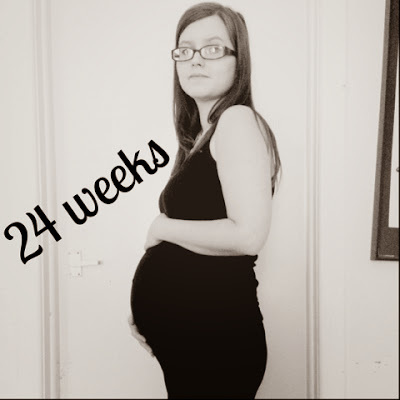 At 24 weeks the baby has put on around 4 ounces since last week making her around 1 1/3 pounds. She is almost a foot long (around the size of an ear of corn). She is filling out proportionally and her brain is growing very quickly now too.